The extreme genetic engineering industry of Synthetic biology (Syn Bio) is shrugging off earlier pretensions that it would usher in a clean, green 'post-petroleum' economy. Now they are partnering with big oil, coal, gas and mining interests. 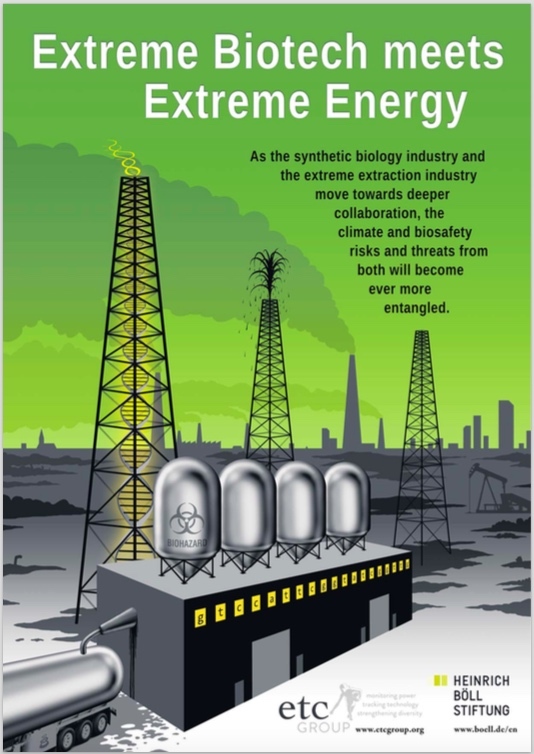 As the extreme biotech industry and the extreme extraction industry move towards deeper collaboration, the safety risks and climate treats emanating from both will become ever more entangled. This report details this emerging fossil-biotech alliance. Details of a dozen private companies and a US Government Programme developing synthetically engineered “methanotroph” microbes that transform natural gas (methane) into fuels, chemicals and foods, using techniques such as “gaseous fermentation”. Analysis of fossil industry agendas to use Syn Bio to capture so-called “stranded gas”, that would increase recoverable gas reserves by 40-60% and may drive up the market value of fracked and captured gas. Analysis of how synthetic biology-based proposals to pump engineered microbes into oil, coal and gas fields – known as “Microbial Enhanced Hydrocarbon Recovery” (MEHR) – could increase available oil reserves by up to 150% thereby massively increasing climate risks. Details of private companies and public research on releasing Syn Bio Microbes for mining metals and minerals.